The Paasche GLAZE GUN is used to apply ceramic glazes on china and porcelain when in volumes too great for an airbrush to handle. 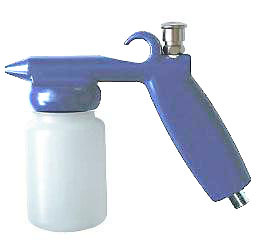 Paasche 62 1-3 Light Consistency Glaze Gun. For applications that fall between airbrush & spray gun. Use w/compressor pressure from 20 to 45 lbs. psi. Accepts 3/16" air hose.